Fast-growing, preferably leguminous, woody species grown in crop fields; the woody species pruned periodically at low height (<1.0 m) to reduce shading of crops; the prunings applied as mulch into the alleys as a source of organic matter and nutrients, or used as animal fodder. Intimate multistory combinations of a large number of various trees and crops in homesteads; livestock may or may not be present. Fast-growing, preferably leguminous, woody species planted and left to grow during fallow phases between cropping years for site improvement; woody species may yield economic products. Fruit trees and other MPTs scattered haphazardly or planted in some systematic arrangements in crop or animal production fields; trees provide fruits, fuelwood, fodder, timber, etc. Intergrating trees in animal production systems: Cattle grazing on pasture under widely spaced or scattered trees. Stall-feeding of animals with high-quality fodder from trees grown in blocks on farms. Growing shade-tolerant species such as cacao and coffee under or in between overstory shade-, timber-, or other commercial tree crops. Use of trees to protect fields from wind damage, sea encroachment, floods, etc. Growing agricultural crops during the early stages of establishment of forestry (timber) plantations. Trees planted in single or grouped rows in herbaceous (agricultural or horticultural) crops in the wide alleys between the tree rows. Utilizing forested areas for producing specialty crops that are sold for medicinal, ornamental, or culinary uses. Strips of perennial vegetation (tree/shrub/grass) planted between croplands/pastures and streams, lakes, wetlands, ponds, etc. 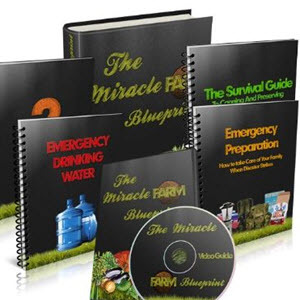 Combining trees with forage (pasture or hay) and livestock production. Row trees around farms and fields, planted and managed as part of crop or livestock operation to protect crops, animals, and soil from wind hazards. and socioeconomic factors; thus, location specificity is an important characteristic ofthese systems. The major prac tices that constitute the multitude of location specific systems in the tropical and temperate regions are listed in Table 1. In a time sequence (temporal) pattern of component arrangement, these practices may be simulta neous (trees intercropped with crops or livestock), or sequential (trees and crops rotated in sequence). The system complexity varies considerably depending on the number and arrangement of component species ranging from relatively 'simple' two species combinations as in tree + crop intercropping (Figures 1a and 1b) to multi strata homegardens (Figure 2), and intensive shaded perennial systems (Figure 3) to extensive animal grazing under scattered trees such as the dehesa system of Southern Europe (Figure 4). The nature, complexity, and objectives of agroforestry vary considerably between the tropics and the temperate region. In many parts of the tropics, climatic conditions favor longer production cycles within a year (than in the temperate regions); thus, the tropics have a large diversity of species facilitating the existence of numerous and diverse agroforestry systems. Besides, socioeconomic fac tors such as human population pressure, more availability of labor, smaller land holding size, complex land tenure, and less proximity to markets often support more and diverse agroforestry systems in the tropics than in the temperate regions. In general, small family farms, subsis tence food crops, and emphasis on the role of trees in improving soil quality of agricultural lands are character istic of tropical agroforestry systems. On the other hand, environmental protection is the main motivation for agro forestry in the industrialized nations, where monocultural production systems of agriculture and forestry have con tributed to reduced biodiversity and loss of forest resources and wildlife habitat, and increased environmen tal hazards such as erosion, nonpoint source pollution of ground water and rivers, and greenhouse gas emission. Figure 1 (a) Integrating nitrogen-fixing, fast-growing trees and shrubs with crops in the same field simultaneously, or in short rotations of 1-2 years of crops followed by 1-2 years of trees, and using the tree biomass as a nutrient source for crops is an agroforestry technology that has gained acceptance among farmers who cannot afford fertilizers. The photo shows G. sepium grown with maize (Zea mays), a practice followed by thousands of farmers in eastern and southern Africa. Photo credit: ICRAF, Nairobi, Kenya. (b) Winter wheat (Triticum aestivum) intercropped with American ash (Fraxinus americana) in a temperate setting, southern Ontario, Canada. American ash is a hardwood timber species that also has esthetic and ornamental values. The growth habits and crown shape of the tree make it amenable to intercropping, causing only minimal shading to the understory species. As explained, environmental protection is the main motivation for agroforestry in the industrialized nations, where tree integration on agricultural landscape can mitigate some of the problems associated with agricultural production systems such as reduced biodiversity, loss of forest resources and wildlife habitat, and increased environmental hazards including soil erosion and nonpoint source pollution of ground water and rivers. Photo: N. Thevathasan. Figure 2 Homegardens that consist of intimate, vertically stratified combinations of various food- and fruit-producing trees and crops around homesteads provide food and cash security as well as social and esthetic benefits to millions of farm households around the world, particularly in the tropics. 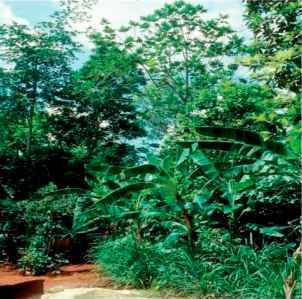 The plants in the photograph, from Jamaica, include: Lower canopy, foreground left: taro (Colocasia esculenta) and greater yam (Dioscorea alata), both edible tuber crops; Lower canopy, foreground right: Guinea grass (Panicum maximum), a fodder grass; Middle canopy, right: banana (Musa spp.) and coffee (Coffea spp. ); Upper canopy, consisting of fruit trees: bread fruit (Artocarpus altilis) in background, and mango (Mangifera indica) in front of that. Photo: P. K. R. Nair. Figure 3 Shaded perennial-crop systems involve growing shade-tolerant commercial species such as coffee (Coffea spp.) and cacao (Theobroma cacao) under overstory shade trees. 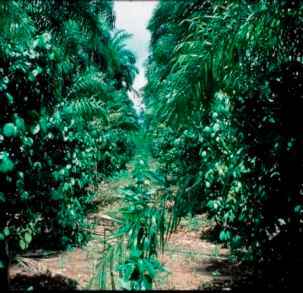 The photo shows young cacao plants in between rows of peach palm (Bactris gasipaes) and black pepper (Piper nigrum) in Bahia, Brazil. Photo: P. K. R. Nair. Figure 4 The dehesa, called 'montado' in Portuguese, is a traditional agrosilvopastoral system practiced extensively in the Mediterranean region of southwestern Europe, where animals (cattle or sheep) graze under scattered trees. The most common tree species are oaks: Quercus ilex ('encina' in Spanish) and Q. suber ('alcornoque' in Spanish). Their acorns are relished by pigs; Q. suber is excellent for cork production as well. Q. ilex dehesas used to be valued more in the past (40-50 years ago) because of the higher animal-feed value of its acorns compared to those of Q. suber; but, today Q. suber dehesas fetch higher value because of the high value of cork. Portugal and Spain are the two major cork-producing countries of the world, and most of this cork is produced in dehesa agroforestry system. Photo credit: David Howlett. and less intensive systems such as taungya and shifting cultivation are common in areas with less population density. In the semiarid tropics also, the nature of agrofor estry systems is influenced by population pressure: homegardens and multilayer tree gardens are found in the relatively wetter areas, windbreaks, and shelterbelts, and multipurpose trees on croplands are found in the drier regions. In regions of highland tropics that have favorable rainfall regimes, sloping lands and rolling topography make soil erosion an issue of major concern; consequently, soil conservation is one of the main objectives of agroforestry in these regions. Shaded perennial systems, use of woody perennials in soil conservation, improved fallows, and sil vopastoral systems are the major forms of agroforestry in such tropical highlands. Several other specific systems also exist in the tropics, for example, apiculture with trees, aquaculture involving trees and shrubs, and woodlots of 'multipurpose trees' (defined in the next section). Alley cropping, forest farming, riparian buffer strips, silvopasture, and windbreaks are the five major agrofor estry practices recognized in North America. Other temperate agroforestry systems include ancient tree based agriculture involving a large number of multipur pose trees such as chestnuts (Castanea spp. ), oaks (Quercus spp. ), carob (Ceratonia siliqua), olive (Olea europa), and figs (Ficus spp.) in the Mediterranean region. The 'dehesa' system (called 'montado' in Portugal), which involves grazing under oak trees and has strong linkages to recur rent cereal cropping in rangelands (Figure 4), is also a very old European practice. What are agroforestry practice in mediterranean?